Dementia can affect anyone. But how we’re diagnosed, how we seek treatment and even how we view memory loss can vary by culture, geography, experience with the health care system and experience with Canadian institutions in general. That’s why Canadian clinicians and researchers are investigating culturally appropriate strategies to provide Indigenous communities with equitable access to dementia care. Karen Pitawanakwat is a registered nurse and community researcher for the Canadian Consortium on Neurodegeneration in Aging (CCNA) Team 20: Indigenous projects – Ontario. She describes a scenario where assessing memory loss in an Indigenous client using common screening tools can lead to confusion. A visiting geriatrician asks an older Indigenous person to complete a simple task. First point to the sky, he says, and then point to the ground. The client doesn’t respond. Indigenous languages are very detailed and particular, says Pitawanakwat, and speaking the truth is one of the sacred principles of the Seven Grandfather Teachings. If you are sitting inside an examination room, how can you accurately and “truthfully” point to the sky? Does the examiner mean the ceiling? Patients may take a long time to process their response, or, within the limited timeframe of a brisk examination, may not respond at all. Pitawanakwat, who is Anish-inaabe Kwe from the Wiikwemkoong Unceded Territory in Ontario, says health authorities have long identified gaps in appropriate and effective dementia care for Indigenous populations. Indigenous people are not accessing dementia care services, and the tools used to diagnose dementia are not culturally relevant. Pitawanakwat’s research has focused on the Manitoulin Islands, but much of her work can be adapted to fit other communities across Canada. The CCNA is a consortium of Canadian clinicians and researchers studying the development of age-related neurodegenerative diseases, their impact, and how to slow their progression. Team 20: Indigenous is the only team within the CCNA focused on strengthening these understandings within Indigenous communities. Since 2007, they have worked closely with traditional knowledge keepers, language experts, and local health care providers in Ontario and, from 2014, in Saskatchewan, to examine how Indigenous culture affects the experience of dementia. “Now you’re now doing this activity together,” says Pitawanakwat. The language is reciprocal, less commanding and more reflective of Indigenous communication and relationships. CICA has now been validated (an academic term meaning it has demonstrated effectiveness) in Ontario, and a version of it is being piloted in Saskatchewan with research currently underway to adapt it to urban Indigenous people in Calgary. The project is just one of the team’s examples of how Indigenous culture can be built into existing health structures to improve client care. Drs. Kristen Jacklin and Carrie Bourassa co-lead Team 20: Indigenous, and Jacklin also founded the International Indigenous Dementia Research Network (IIDRN) and the Indigenous Cognition & Aging Awareness Research Exchange (i-caare). The goal of the i-caare website is to explore and promote healthy aging among Indigenous communities and to raise awareness about cognitive health. Jacklin’s research shows that the prevalence of dementia in Canada’s Indigenous communities is 34 per cent higher than the rest of the population — a rate that is steadily rising — and the average age of onset is 10 years younger. According to the Alzheimer Society of Canada, some of the risk factors of age-related dementias include increasing age, genetics, diabetes, head trauma, social and economic status, and cerebrovascular disease and its associated factors such as hypertension, stroke, smoking, and obesity. Many of these risk factors disproportionally affect Indigenous people. Blind has been a part of the research team since 2014 and is currently a senior research associate with the Memory Keepers Medical Discovery Team at the University of Minnesota Medical School Duluth. She says that for meaningful change to occur within the health system, we need to understand not just the biomedical context, but the lived experience of Indigenous people. Furthermore, Indigenous communities have cultural perceptions of memory loss that contradict the idea of dementia as a diagnosis of impairment. There is no directly translatable word for dementia in the Indigenous languages spoken on the Manitoulin Islands, but an Anishinaabe word,“keewayabinoocheeaway,” describes age-related memory loss as a return to childhood. Karen Pitawanakwat says this reflects the traditional teachings of the medicine wheel. At birth, she says, we enter the physical world through the Eastern doorway. When we leave the physical world and return to our spiritual form, we travel through the western doorway. At that time, the eastern and western doorways are close together. An elder who is experiencing symptoms of dementia is seen as “coming full circle” in their journey back to the spiritual world. Pitawanakwat says children and elders are considered to be closest to the Creator. “Towards the end of life, you become like a child again. You go through that doorway to meet your Creator, to that ever after place of happiness,” she says. Developing an ethical relationship with Indigenous communities has become part of the critical discourse on health and health care in Canada. 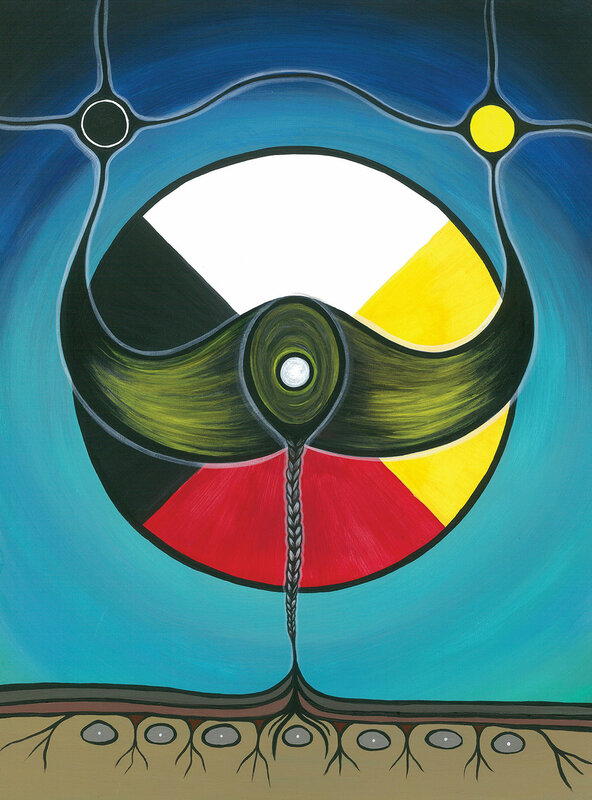 Many research groups, including Team 20: Indigenous, have embraced the methodology of “two-eyed seeing,” which incorporates the strengths of both Indigenous knowledge and Western knowledge to determine and deliver the benefits of both. Dementia is on the rise in both Indigenous and non-Indigenous communities throughout the country and can be confusing, isolating and overwhelming. Adapting health care protocols that are culturally safe and therefore more effective, building relationships with clients based on their unique lived experience, and educating communities on dementia without diminishing their beliefs — these are practises that Blind says can benefit everyone.